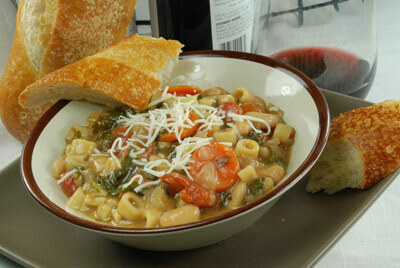 ... an Italian country soup that could easily be a meal in itself. In a 4 quart pot combine olive oil, onion, celery, carrot and garlic. Cook, covered, over medium heat for 5-8 minutes or until onions are soft, but not brown. Meanwhile, combine fresh herbs, (no parsley yet). Stir in flour and half the herbs; cooking for 5 minutes more. Add 1 cup water; stir to smoothly incorporate flour into liquid. Simmer for 3-4 minutes, stirring. Add remaining water, soy sauce, tomatoes and white beans. Simmer, covered, for 30 minutes to allow flavors to blend. Season with salt and pepper. Add spinach and cooked pasta, simmer for 3 minutes more. Combine parsley with remaining herbs. Stir into soup. Serve with generous amount of grated cheese. *May use canned beans rinsed and drained. Add with spinach and pasta.